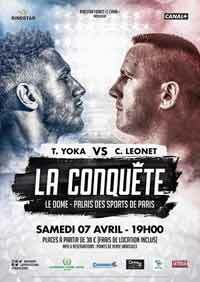 Review by AllTheBestFights.com: 2018-04-07, pretty good finish between Tony Yoka and Cyril Leonet but it is not enough to get three stars: it gets two. The 2016 Olympic super heavyweight gold medalist Tony Yoka entered this fight with a professional record of 3-0-0 (2 knockouts – while his amateur record is 60-12-0) and he is ranked as the No.82 heavyweight in the world while his opponent, Cyril Leonet, has an official boxing record of 13-9-3 (4 knockouts). Yoka debuted last year winning over Travis Clark (Yoka vs Clark), Jonathan Rice (Yoka vs Rice) and Ali Baghouz (Tony Yoka vs Ali Baghouz) while Leonet lost once in 2017, against Raphael Tronche; after this bout he has beat Alban Galonnier in 2018. Yoka vs Leonet is the main event of the evening. Watch the video and rate this fight!